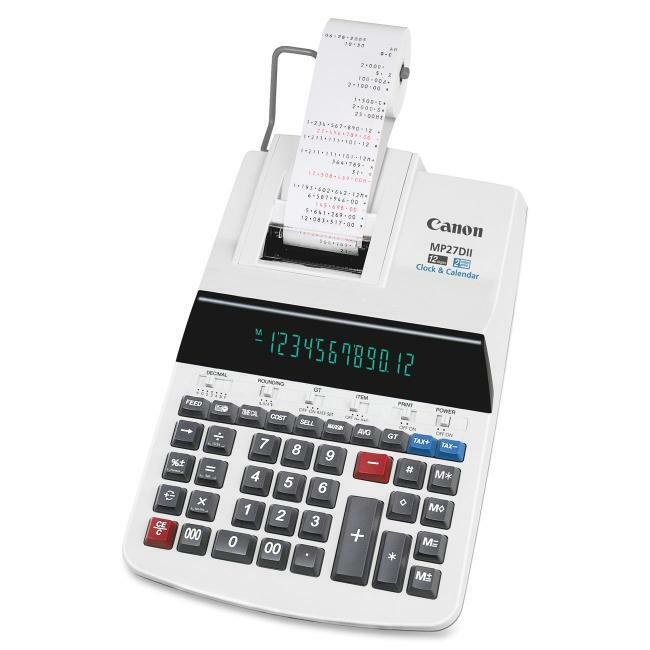 12-digit heavy-duty printing calculator features an extra-large, fluorescent tube display and a high-speed, two-color ribbon printing. Print 4.8 lines per second with positive numbers in black and negative numbers in red. Plain paper roll is 2-1/4" (57mm) wide. Quick reference guide briefs you on main functions or address book information. Functions include time calculation, average, one-touch tax calculation, clock/calendar, cost/sell/margin calculation, sign change, item count, memory, grand total, round-up/off/down, shift key, and 0, 00, 000 keys. Decimal point positions include add mode, 0, 2, 3, 4, 6, and floating. Calculator runs on AC power and shuts off automatically after seven minutes.